While searching Hyrule for Navi, Link is robbed of the Ocarina of Time and his horse Epona by a Skullkid wearing a mysterious mask. Giving chase, Link ends up in the world of Termina, where the Skull Kid has caused the moon to fall. Link has just three days to climb the Clock Tower and take back his Ocarina, allowing him to reset time and put right the evils of Majora's Mask. With the ability to reset time, Link must travel across Termina and awaken the Four Giants. 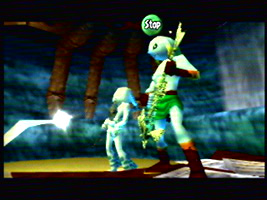 On his quest, Link uses special masks to take the form of a Deku, a Goron and a Zora. You can also help the people of Clock Town with their problems, marking their daily schedules in your Bombers Notebook. 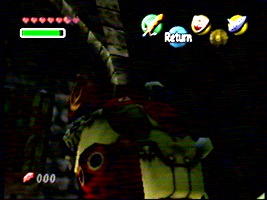 Once you meet the Mask Salesman inside the Clock Tower, check out the masks attached to his backpack. One of the masks is a Mario mask. The working title for the GameCube was the "Dolphin", and Nintendo slipped many references to the name into their games. Gain access to the Observatory just outside of Clock Town and head into the basement (where the scarecrow can be found). Smash some of the jars to find a rough sketch of a dolphin on the floor. 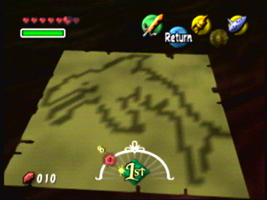 When you are Zora Link, the swimming move you perform when pulling up and leaping out of the water is named the "Dolphin Jump". This may simply be a reference to its similarity to a real dolphin's jump. Submitted by Fryguy64, John N.
In Ocarina of Time, the Keaton Mask was a cameo of Pikachu from Pokémon, but now it's a whole new character. Help out Anju and Kafei and you will receive the mask eventually. 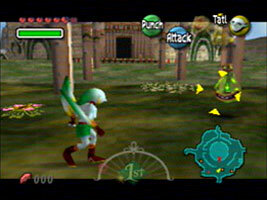 Slash moving grass while wearing the mask and the ghost fox Keaton will appear. It still looks like Pikachu from the neck up, but it is based on the Japanese ghost fox, the Kitsune. Incidentally, the Kitsune was also the inspiration for a different Pokémon, Vulpix and Ninetales. Head to the great Zora Hall before the third dungeon where the members of the Zora band, the Indigo-gos, are jamming in their rooms. All of their riffs are from the dungeons and caves from The Legend of Zelda (NES) and A Link to the Past (SNES). You also get a chance to play the Ballad of the Wind Fish from Link's Awakening in the Clock Town milk bar when you have all the masks. 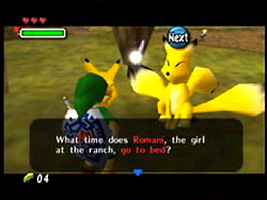 The Bowser pendants worn by Malon and Talon on Lon Lon Ranch in The Legend of Zelda: Ocarina of Time reappear in Majora's Mask, this time worn by Romani and Cremia, the two girls who run Romani's Ranch.